Experts are warning that an outbreak of the tick-borne disease Babesiosis is of 'huge significance' to the health of pets as it threatens to spread throughout the UK. But what is Babesiosis and how can it affect our dogs? Babesiosis is a malaria-like disease caused by the babesia canis parasite, which is spread by ticks. Like malaria, once contracted the parasite infects and replicates in the body's red blood cells, eventually leading to severe anaemia as the immune system rapidly attacks and destroys its own blood cells. Symptoms of infection will vary, but look out for the following: lethargy or weakness, feverishness, jaundice, pale gums, brown or red urine, and discoloured stool. While the incubation period for Babesiosis is about two weeks, sometimes symptoms remain so mild that diagnosis might not be made for months. Therefore, if you have any suspicions at all, it is best to get your dog checked out by a vet. Currently, four dogs have been confirmed as having the disease, with two requiring blood transfusions and another, sadly, having died. This is in Harlow, Essex, where all four dogs were walked on a similar patch of land. Since the outbreak, the local council has acted quickly to draw up maps for dog walkers highlighting which areas to avoid, but there is every chance that cats and foxes will come into contact with babesia canis as they pass through the same areas. Although the disease is not thought to present a threat to either cats or humans, it is sensible to regularly treat all outdoor cats with a tick treatment to prevent them transferring their ticks to dogs. Despite experts predicting an inevitable spread of the disease, there are many things we can do to stall its progress and safeguard our pets. 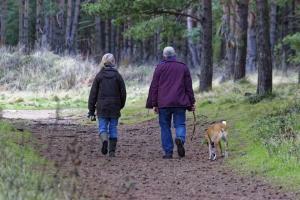 Ticks can be found anywhere but they are more prevalent in rural and woodland areas. If you regularly walk your dog in these types of places, it is important to take the proper precautions. Ticks are difficult to spot, but once engorged with blood from having feasted, they are much easier to notice and remove. If you happen to see a tick, grasp it close to the skin with a pair of tweezers or specialist removal tool and smoothly pull it out. Try not to puncture or break the tick as this can lead to infection. Once you have removed a tick, put it into a solution of alcohol before disposing of it. Generally speaking, if a disease carrying tick is removed from the skin within 24-48 hours, the risk of transmission is reduced. If your dog has a particularly thick or long coat that makes it harder to notice ticks, use a hair dryer and focus your attention behind the ears, around the head, on the underside, between the toes and at the base of your dog's tail. Admittedly Babesiosis is very worrying but it is important not to panic as transmission of tick-borne diseases can be prevented. If you regularly use a tick treatment and check your dog for ticks after every walk, you minimise the risk significantly. It is also important to bear in mind that the disease vector - the Dermacentor reticulatus tick - is uncommon in the UK, and not all ticks will carry the harmful parasite anyway. Thank you for information, most helpful. Good to have access to such detailed information. Have two dogs and one has a very thick curly coat so will need to be extra vigilant. Good clear information, very useful. Thanks for your article. My vet advised against flushing ticks down the toilet. It is best to kill them in alcohol. I always have a shot glass of wine or a spirit ready for the second I remove one. My vet took them last year as part of a survey. I thoroughly recommend the O'Tom tick twister tool, so much easier to use than tweezers as you get right to the jaws of the tick and you don't squeeze the body of the tick as you twist and remove it (I learnt the hard way not to use tweezers!!). My dogs had ticks at the beginning of February as the winter was so mild, I keep them off for the rest of the year by using Advantix once a month. I used to live in Zimbabwe and this used to be a big problem with both our dogs and horses, just wondering about the possibility of horses getting infected over here? Thanks so much for that information .